Last week I went by Page Manor expecting to see the mansion half destroyed, but instead found that much of the rear addition demolished and the main house still intact and wide open. A large central hall ran from the front entrance to the rear wing of the home with grand suspended staircase taking up the back half. The double doors at the landing, which led to the 2nd floor of the addition would have likely been the location of a large window. The hall and stair had paneled wainscot, columns and a decorative beamed ceiling which had all been painted white, dulling the effect. 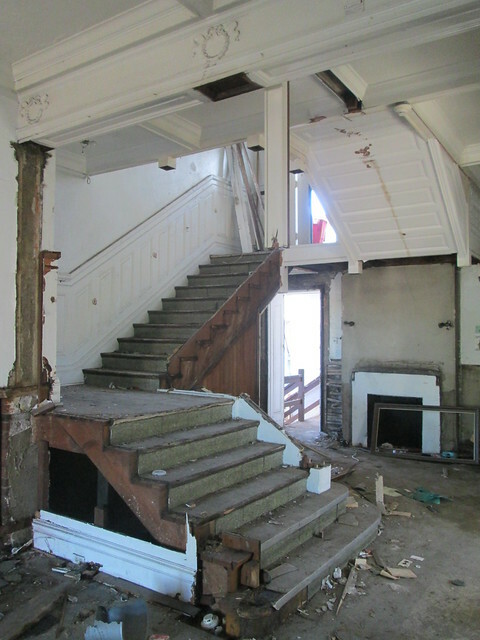 Most of the wainscot, columns, stair balusters, door and window trim had been stripped from the home already. As the grand stair ascends to the 3rd floor, a section of paneling that remained unpainted gives a hint at the warmth and richness that once filled the home. 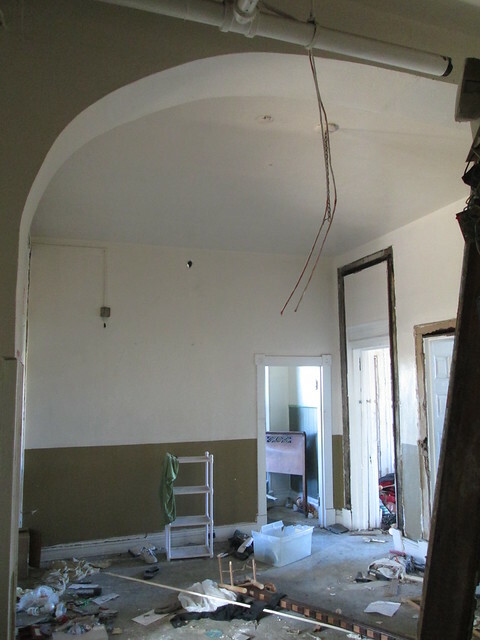 Back in the first floor hall, the outline of the moldings shows the grand scale of everything in the home. The infill wall and smaller standard size door had been added to create a private room. Outside of the central hall, the dining room was the most ornate room still largely intact. 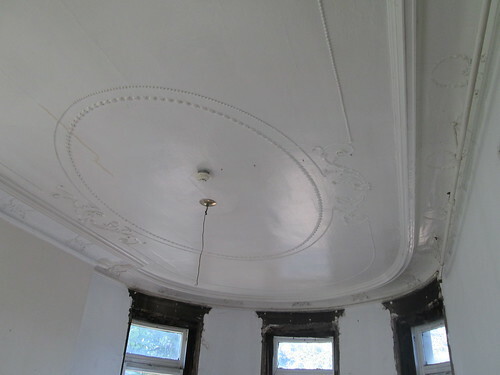 A deep plaster cove molding runs the perimeter of the ceiling. 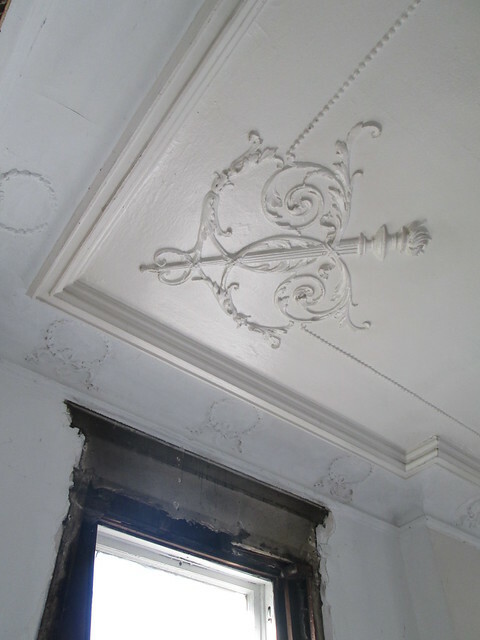 A close-up of the plaster moldings that decorated the corners and field of the ceiling. 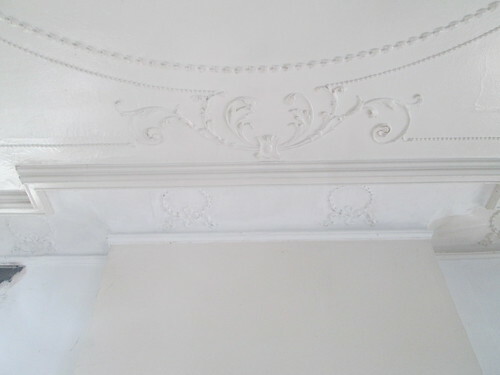 More plaster moldings over the chimney breast. The second floor hall was far less ornate than the first floor. 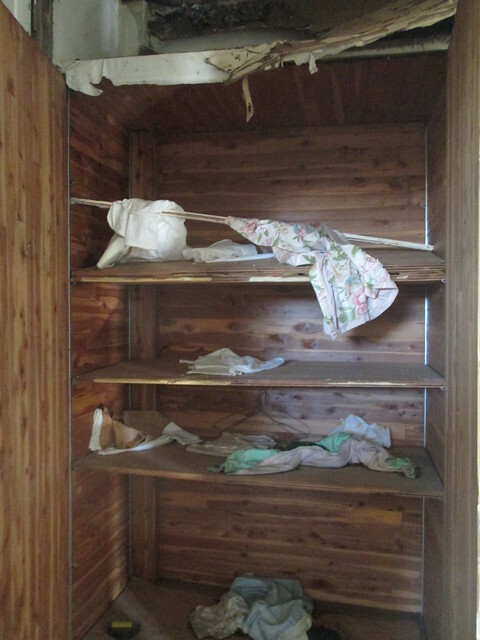 An intact cedar lined linen closet in the rear wing of the 2nd floor. 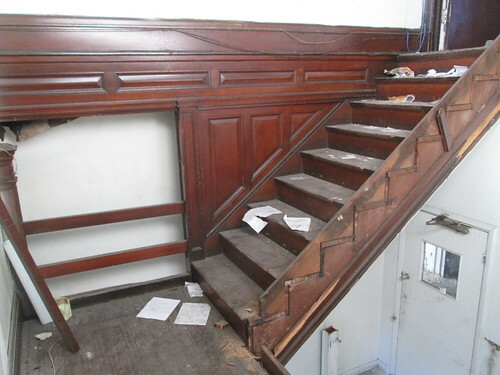 These were once a standard feature of large homes. While the mansion suffered from many cosmetic changes over the years, it was largely in excellent condition and had all of its original windows. 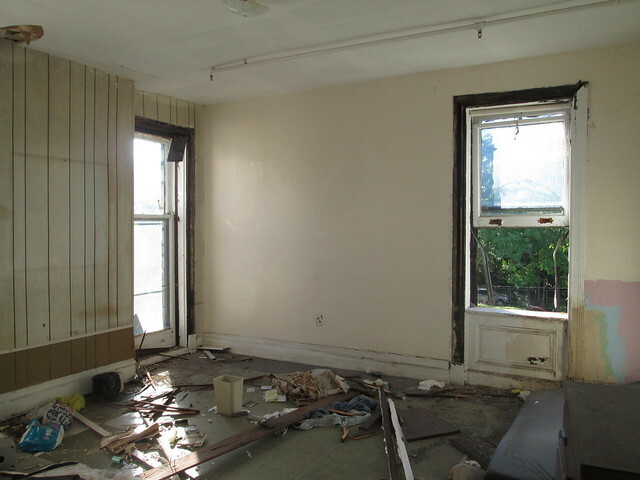 This is typical of the second floor rooms. The Jefferson window led to a rear porch. 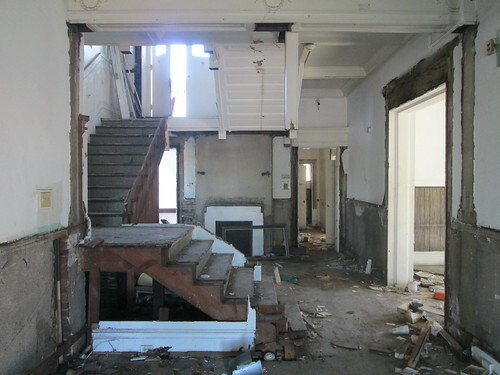 Most of the second floor of the addition had been de-constructed and soon the mansion will meet a similar fate. From the methodical way the building is being demolished it appears that most materials are being salvaged. Page Manor is Being Demolished! Last week I was tipped by a question someone posed on an unrelated Landmarks photo post to Facebook about what is going on at Page Manor? 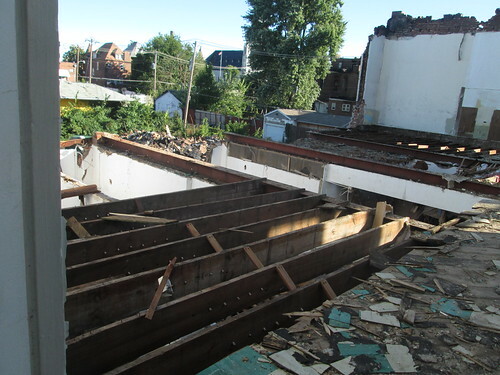 I looked on the Geo St. Louis and found that a demolition permit had been applied for in July. 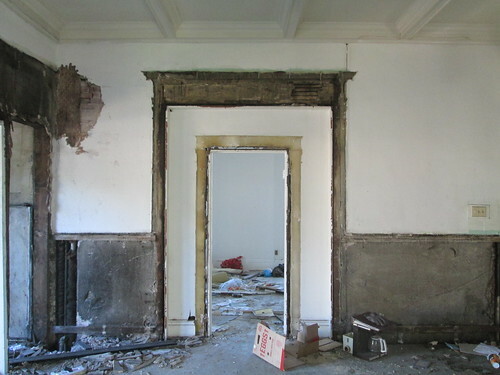 The wrap-around porch has already been removed from the front making it clear that the mansion would soon follow. 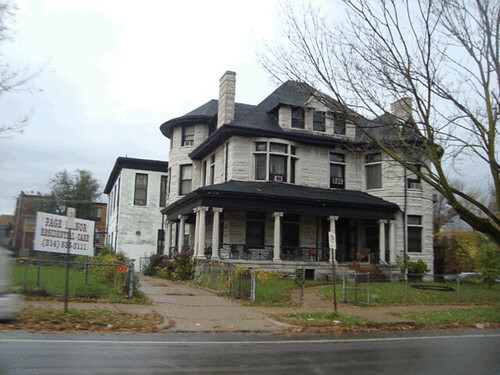 The mansion is located on Page Boulevard just west of Grand. This is a tragic loss of one of the last grand homes in this area. With Vandeventer Place once being located just a few blocks south, Midtown's boulevards were once dotted with mansions, but this one even then stood out on what was a dense block of upper middle class homes. Over the years though, most of the mansions long ago disappeared. 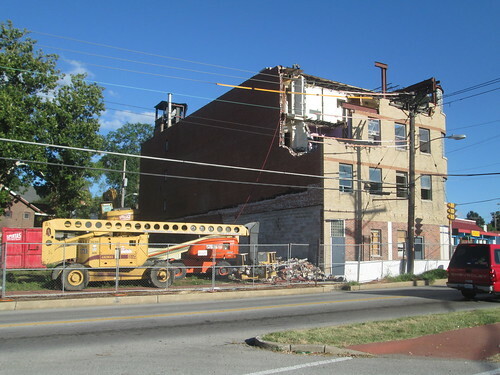 This demolition is yet another reason St. Louis needs City-wide Preservation Review instead of this policy up to the whim of 28 different Aldermen. 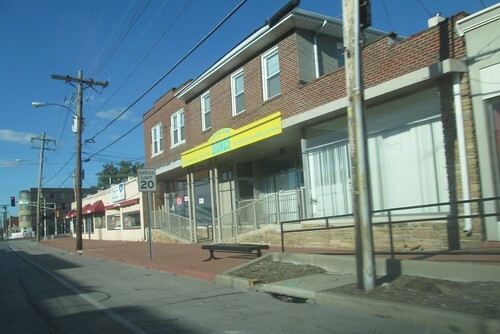 The 19th Ward, where Page Manor is located does not have Preservation Review. 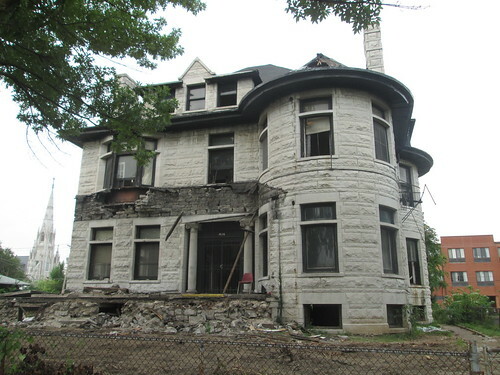 The mansion was built in 1888 according to the City's data and has been used as a nursing home for decades. A large brick addition connects the main house with the original carriage house at the rear of the property. From the style of construction I would guess that the addition dates from somewhere between the 1920's and WWII. As I was photographing a guy who works at the Grand Manor senior residential building across the alley to the south came up and commented about what a shame it is that the old home is being demolished. He told me that Grand Manor was once located there and there are a few people who work there who were at the old building 30 years ago. 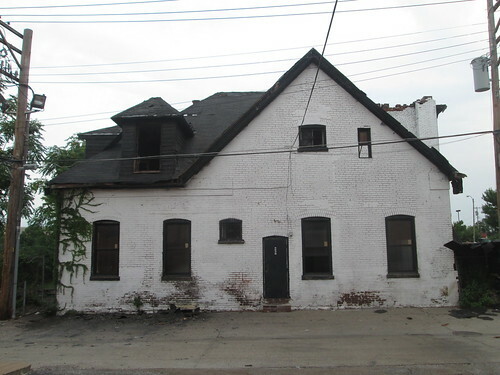 The original carriage house as viewed from the alley. 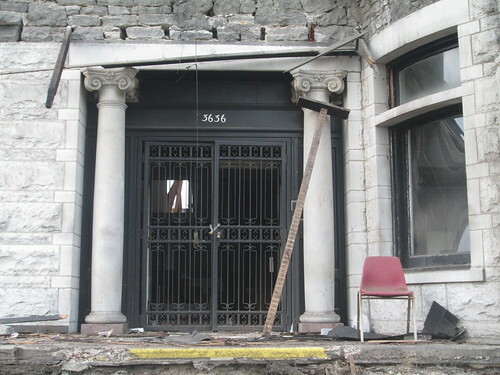 This photo from a few years ago (from Geo St. Louis) shows the original porch. The building was occupied until a few months ago. 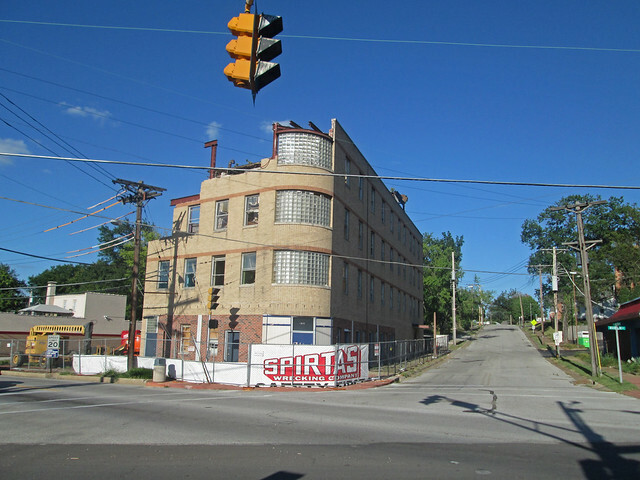 The future of the property could see new construction of a replacement facility on the site. City records show that a zoning only permit for a new residential care facility was applied for in 2009, but the guy from Grand Manor said that the owner of this home just opened another building on Hebert. This might indicated that plans for a new facility here are dead. 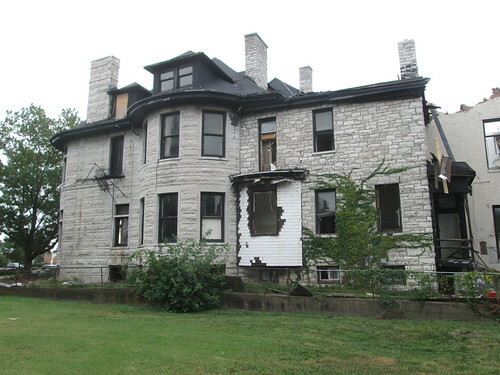 This mansion would have easily qualified for listing on the National Register and the rehabilitation tax credit incentives that come with listing. 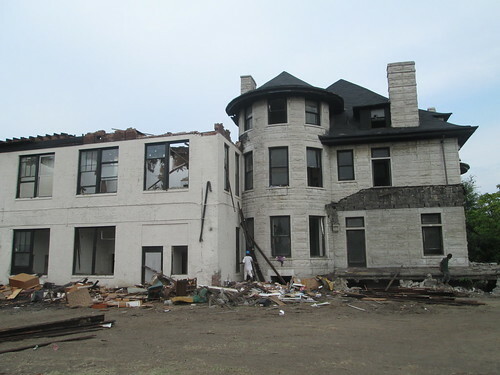 Sadly, there are a large number of vacant blocks land large enough for new construction in the immediate vicinity of the old mansion that could have been used for a new facility instead of immediately turning to demolition. One of these groups of vacant parcels is right across Cook Avenue from Grand Manor, which was the site of four beautiful and unique townhomes built just seven after the mansion now being destroyed. I happened to be driving down Midland Boulevard last week and noticed that that the demolition of the Midwood Hotel is now underway. I posted in May that St. Louis County is considering installing a roundabout at the intersection of Midland and Woodson. The hotel is being demolished as if the decision to build the roundabout is fait accompli. However, it appears that the public process for the decision has only recently begun. 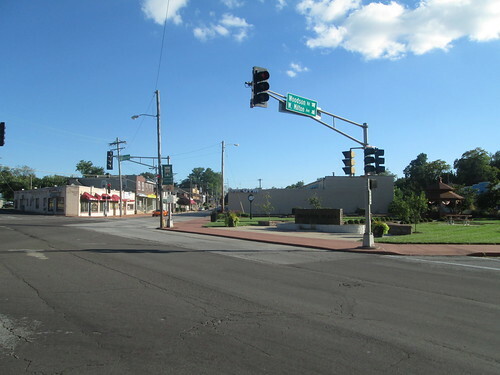 According to an Overland online calendar, there was a public information meeting held by the City of Overland and the St. Louis County Department of Highways & Traffic (not to be confused with the Bicycle Department) on August 19th. The calendar says that the conceptual design of the roundabout was to be presented. If anyone happened to go (or knows of an online link), we would love to see the proposal. 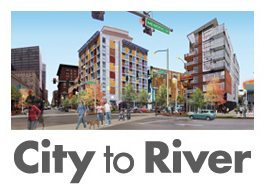 Also in late August, the City of Overland set up an email account for residents to post comments about the proposal, and so far there seems to be no announcement of conclusions. Demolition of the building is being completed from front to back. 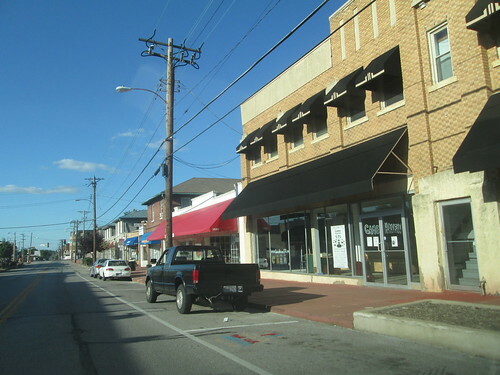 Downtown Overland along Woodson is very intact at walkable south of Midland. 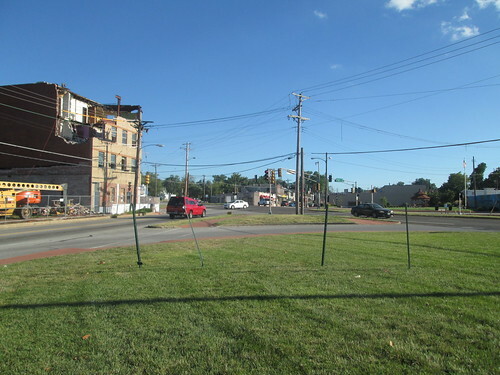 Although Midland is a wide boulevard, a renovated Midwood Hotel could have acted as a real catalyst connecting the main downtown area with the area north along Woodson. The continuity of the downtown at the intersection is already challenged with what appears to be a fairly underutilized park complete with gazebo at the southwest side opposite the Midwood. The intersection is also challenged by big dead space in front of a Quick Trip on Woodson immediately behind this shot (and by the Quick Trip itself). The grass area is mostly part of Quick Trip's parcel up to the cut-off turn lane from Woodson to Midland.